Tate torches GMs at North American Open! Questions often swirl on the ICC swirl about FM Emory Tate. Some wonder whether Tate is a real chess player, but to prove he is not a mythical figure, Tate surfaced at the North American Open and closed out the tournament with wins over GM Evgeny Agrest of Sweden and GM Amir Bagheri of Iran. With two more GM notches on his belt, it is hopeful that he can string them together in major tournaments to earn GM norms. 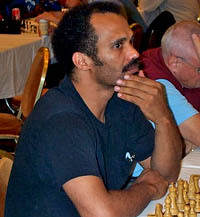 "ET" placed joint 2nd with 4½-1½ with five others including past U.S. Champion, GM Alexander Shabalov. There was a four-way tie for 1st with GM Alexander Moiseenko of the gold-medallist Ukrainian national team leading the way with GM Varuzhan Akobian, Poland's GM Kamil Miton and GM Gregory Serper all scoring 5-1.